Sumptuous, colour-changing, semi-double peony flowers will bring an opulent show of magnificence to any garden. Gradually transitioning from salmon to a subtle pastel orange, the opulent show of blousy blooms really must be seen to be believed! A holder of the prestigious RHS award of garden merit, Coral Charm certainly lives up to its name, with the cupped blooms topping 8in across and going through a series of subtle colour changes as they mature. Supplied as 3 x premium bare roots with 2-3 buds. 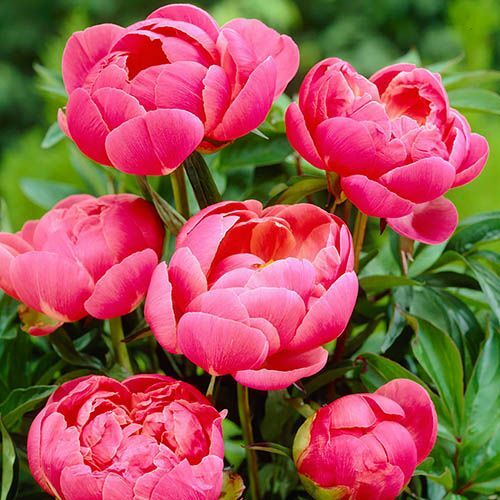 Topping slender, blushed flower stems, the large, showy flowers of Peony 'Coral Charm' bud up a fabulous deep tangerine-pink before breaking into full blooms of the most amazing salmon. Gradually transitioning to a subtle pastel coral-orange and finally a pale, creamy pastel orange, the opulent show of blousy blooms really must be seen to be believed! Peonies can tolerate drought quite well, but they need plenty of water if they are to flower well. Peonies seldom need to be divided or moved, but if necessary, it should be carried out only in the autumn.